My AirBnb Brooklyn Half Marathon training may be over, but I’m now training for the Chicago Marathon! My coach and I opted for a 20 week training plan this time so that I could slowly introduce tempo runs and hill repeats. When I trained for the NYC Marathon last year, it was all about getting in the miles. This year I want to PR in Chicago, so training will be a little different. As long as my IT band cooperates, I think everything will be okay! One week down, 19 more weeks to go! 45 minute walk. My legs, specifically my hamstrings, were very sore and tight so I opted to kick off marathon training with a walk. 2 mile run + 30 minutes of recovery Yoga. My hamstrings were still pretty tight so this run was slightly uncomfortable. I decided to do Yoga for Recovery from the Runner’s World Yoga for Runners DVD. It really helped! I followed up with some foam rolling and my hamstrings felt about 90% better. 55 minute Boot Camp class. The instructor focused a lot on legs – ouchie! First tempo run in over a year! 3.5 miles total (2 miles easy, 0.5 mile tempo, 1 mile easy). This was a great way to slowly incorporate tempo runs back into my training. It’s all about baby steps! Rest days are the best days! First long run of this new training cycle and my first time doing hill repeats in a LONG time. 6 miles total with 3 hill repeats in the middle of the run. I was happy with this pace but the hill repeats were hard! Hopefully it gets easier with time. I also tried out Vega Clean Energy. I believe this product has been out for a while, so it’s not necessarily new, but it’s new to me. I really liked it and I did feel that it gave me some energy, especially to help with the hill repeats. Also I didn’t have any GI issues. I think I’ll continue to use it before my runs. I’ll be trying out different fueling products during this marathon training cycle. Nothing wrong with my go-to brands (Nuun and Honey Stinger), but I want to test out a few other products to see if they might work better for me. On Saturday I also received my two grab bags from Pro Compression! Of course I already had most of these socks, lol. If you also ordered a grab bag and want to trade, just let me know! 60 minutes Spinning + 30 minutes recovery Yoga. While I loved my double workout Sundays, I won’t be able to do that during marathon training (it’s just too much). I’ll alternate each week between spinning and the weight training class. Adding in Yoga on Sundays is great to stretch everything out before another week of training! Overall I think week 1 of training went very well. For some reason my quads and hamstrings were pretty beat up from the race. I used Sunday of last week and Monday to recover from the half marathon. The tempo run and hill repeats went pretty well this week. I haven’t done any speed work in a long time because whenever I would try to run faster, my IT band would get cranky. So far, so good, but I’ll be on the look out for any issues with that. My knees were a little sore when I started my long run yesterday, but they didn’t hurt during the hill repeats so that’s a huge win in my book! Totally unrelated, but there are two sales I wanted to mention before signing off. Honey Stinger is offering 25% off all products until May 30. Did you have a good week? Are you training for any Fall races? I’m linking up with Holly and Tricia for their Weekly Wrap, the Jess’s, (Jess Runs Atlanta and Jess @ The Right Fits) and Courtney for their Training Recap Link Ups! I was a little worried about jumping right into another training cycle but thankfully the mileage isn’t that high yet so it’s going well so far! No problem – always happy to share a good sale on products! Yes their gels are pretty good, and they taste good (they aren’t too sweet). If I hear of a PC grab bag sale on the calf sleeves I will be sure to let you know!! I just ordered white procompression socks with that deal – I should have gone for a grab bag, but I ordered a fun pattern too. I love your picture of the bean – I had a hard time finding it the first time since it’s sort of hidden in a park! You will be in fine shape for Chicago! With the grab bag you just never know what you’re going to get, lol. I was definitely hoping for more patterns, but it’s okay! The only reason I found the Bean on my first trip to Chicago was because I walked there with a friend from the city, lol. Great job on your first week of training for the Chicago Marathon! Glad you had some sunshine over the weekend. I’m sad the rain is headed back down south for us all week :(. I’m not training for anything specific right now but I ran 6 miles Saturday just to keep up my long run base. Hope you have a great Memorial Day! Ugh, this weather is so wacky! That’s so smart to keep a great running base even though you aren’t in training. That way when you’re already in great shape for whenever you start training! Hope you have a great Memorial Day as well! I’m so excited for you to run Chicago! I swear, if someone gave me a free entry, I’d jump right in. It’s just the best! Thanks Wendy! I’m super excited to run the Chicago Marathon! I really love the city. Yay to a great first week for you!!! Congrats on kicking off your Chi training. You are wise to back off a touch after your half to let those hamstrings recover. Thanks for the Honey Stinger heads up. I need to restock! Thanks Marcia! I just love Chicago and can’t wait to get back there! My hamstrings have never been an issue for me, so when they felt so tight/sore, I knew I needed to back off training a little. Hope you’re able to order lots of Honey Stinger goodies! Great week! I’ll be starting Chicago training soon too! I’m so excited to follow along with your marathon training. My last full was in 2014. I definitely want to run another one, but for now, I’ll live vicariously through you. Great job on week 1!! Thanks Clarinda! I’m sure you will run another marathon one day and I’ll be excited to follow your journey! Thanks Teresa! Definitely try out the clean energy – they have two flavors to choose from! Great job this week! It so important focus on recovery after a race and not jump back in too quickly. My Stridebox shirt arrived this weekend too! I need to remember to take a picture in it. Thanks Lisa! Even though I didn’t technically have a break between training cycles, I still wanted to ease into marathon training this week. How cute is that shirt from Stridebox? I love it!! I hear ya with the IT band. It’s always a gamble not know what will aggravate it. What do you do when you get a flare up? When it flares up I do a lot of foam rolling, like a ton of it! I also do PT exercises like one legged bridges, etc. Good luck in your marathon training! I have to say I’m happy you honored your half marathon recovery this first week. Smart! Thanks Debbie! I figured better to start off slow than to make an injury worse! How fun to be starting marathon training for Chicago! I have a little unfinished business there (not falling next time!). I love your picture of the bean at night. My hammie keeps getting sore — that’s a new one for me. Let me know if you have any good tips for that. Thanks for linking, Kim! I’m really looking forward to Chicago. I got the photo of the bean from Google, lol. We’re both been blessed with weird hammies this past week (insert sarcasm, lol). I did a lot of stretching in downward dog to help with my hamstrings last week. Holy cow I am tired just reading this recap! Nice way to kick off marathon training, I’m glad to see you took it easy the first few days to recover from your half. Way to go! LoL, thanks Jess! I was more than happy to ease into training at the beginning of last week! A very solid first week! A long run with hill repeats is a tough workout. Tempos — I definitely love to hate them. Thanks Judy. I was so out of breath after my tempo run and after doing the hill repeats. I know that I need to work on those two things more and hopefully it will get easier! Yay marathon training! We’re on the same timeline – my race is just a couple weeks before yours 🙂 Cheers to a great training cycle. I’m starting a new training cycle this week, so I love seeing all these fall race training plans kicking off! Sounds like you had a great week! Focused workouts should serve you really well in your quest to PR. I’m also in the market for different fueling so I really liked hearing your thoughts on the Vega! I’ve used their protein powders in the past and have been thinking about trying it out the Clean Energy for a while. That’s awesome Tracy! I use Vega protein powders and recovery accelerator and love both. The clean energy was really goo and I’m looking forward to using it before my runs. It comes in one other flavor as well. Sounds like a great week of training! 19 more to go and it’s going to breeze by…!!! I don’t know if it will breeze by, lol, but hopefully it will be a pain-free training cycle! I’m intrigued to compare how your training goes vs. mine. I’ll be kicking off my 18 week plan next Monday, and am excited, nervous, and scared all at the same time about training for my first marathon. Eek! Oh my gosh, I LOVE your I like to Party shirt!!! I wish I would have purchased the Pro Compression grab bag, you got some awesome ones! Interesting to hear how you like Vega- I know a lot of people who love it, but I haven’t tried it yet. I’m sure that Pro Compression will have another grab nag at some point this year – I’ll give you a heads up if I hear anything! I use other Vega products but the was my first time using their Clean Energy – it’s really great!! Okay, only because I suffer from the IT Band as well, when was the last time you had your gait checked? Sometimes the smallest tweak of the shoes helps a ton. Good luck this training. You’ll do great! I haven’t had my gait analyzed in a while, probably over a year – great idea to get it checked!! I’ll definitely look into that. Sounds like a great kick off to your training! You have a lot of variety in your weekly workouts 🙂 I love the Runner’s World yoga stuff on their website. I had no idea they had a DVD too. I’ll have to look into that. Thanks Chaitali! I like to have a lot of variety in my workouts – it helps me from getting bored, lol. I have been procrastinating on getting my Chicago Marathon training started, but I guess it’s here! I’m looking at a 16 week plan, so I still have a little time to formalize things. Thankfully, the nice weather has finally arrived…hopefully here to stay! It’s a bucket list race for me and I love the city so I am hoping it will be a great race! It looks like you’re off to a great start! I look forward to following along your road to a marathon PR! Fingers crossed! I feel like I had some unfinished business in NYC so I would love to redeem myself in Chicago. That’s so awesome! I love that so many runners are tackling Chicago this year! Amazing first week of training. I’m running Chicago, too! My training starts on Monday! That’s awesome! 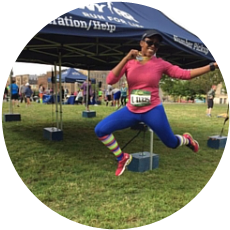 I keep meeting so many runners that are doing Chicago – it makes me so excited! I’m excited to follow your Chicago training and the different products you try! Is the Vega Energy a pre-run or during run product? How was the taste? Good luck with getting your PR. Thanks! The Vega Clean energy can be used pre-run but can also be used as a “pick me up” during a workout. It didn’t taste bad at all – not too sweet and I loved the citrus flavor.